This is why it is so important to choose a nutrition plan that has some purpose behind it and will help personally support you on a road to better health, rather than just choosing another fad diet that will only leave you feeling deprived. This is especially true when it comes to doing a diet like the GAPS Nutritional Protocol. For me and my family, it was all about finding a plan that would help with the migraines, stomach pains, constipation, joint inflammation, asthma, eczema, autism, and so much more we were collectively experiencing. But even though this nutritional protocol has stories of great success and I had the motivation to do it due to the all of the health ailments we were experiencing, it doesn’t mean it isn’t hard. It’s not easy taking out foods that you’ve been used to eating most - if not all - of your life. Especially when the majority of the foods you’ve been eating are part of the Standard American Diet. When you really break it down though, these food-like-substances that might seem somewhat scary to take out of your diet are really foods we shouldn’t be eating anyway, whether you’re following the GAPS Diet or not. These foods simply don’t nourish us on a physiological or biological level. For this reason, I really try (and have my clients try) to focus on all of the nourishing foods that CAN be eaten on the GAPS Nutritional Protocol instead of focusing on what we have to eliminate. Just this simple mindshift has allowed me to center my attention on healing without feeling so deprived in the process. Especially during the early Intro Stages of the diet when the symptoms of detox truly are no joke! Hopefully this perspective also helps you as much as it has for me. Grains: wheat and anything made from wheat flour (pasta, breads, crackers, biscuits, cakes, pastries, etc. ), rice, oats, corn, barley, rye, quinoa, buckwheat, millet, amaranth, semolina, spelt, couscous, tapioca, etc. After about 1-2 years you may be able to slowly re-introduce fermented buckwheat, millet and quinoa, but not wheat, rye or rice. Sugar and sweets and anything that contains them: cane sugar, chocolate, jams, jellies, pastries, ice cream, anything ending in an -ose, etc. Syrups: Molasses, maple syrup, corn syrup, carob, agave, or any other syrup. Aspartame or any other artificial sweeteners. Cereals, including all breakfast cereals. Starchy vegetables and anything made out of them: potato, sweet potato, Jerusalem artichoke, okra, yams and parsnips. In about 1-2 years you may be able to introduce new potatoes. Beans and pulses: baked beans, bean flour and sprouts, black-eye beans/peas, Canellini beans, chickpeas, Faba beans, garbanzo beans, and Mungbeans. (Green beans and white/Navy beans fermented and cooked at home are allowed). Canned and processed foods: processed meats (bologna, ham, hot dogs, commercial sausages & preserved/smoked meats, smoked/preserved/canned fish, etc. ), certain dairy (buttermilk, processed cheeses, cheese spread, Chevre cheese, cottage cheese, cream, cream cheese, Gruyere cheese, milk, ricotta cheese, Mozzarella cheese, commercial yogurt or sour cream, etc. ), canned fruits and vegetables, etc. Certain nuts: nuts (salted, roasted, and coated), chestnuts and chestnut flour. Soy (soya) and anything made out of it: soy milk, tofu, etc. Coffee, instant and coffee substitutes. Alcoholic beverages: beer cordials, liqueurs, Sherry, etc. (Adults may have good quality wine occasionally with meals). Fruit juices (unless freshly pressed by you): i.e. ; commercial apple juice, etc. Soft drinks are not allowed at all. Anything with artificial colors, preservatives, flavorings and other processed chemicals. AND: arrowroot, Baker’s yeast, baking powder, balsamic vinegar, Bouillon cubes or granules, Carrageenan, cellulose gum, chewing gum, cooking oils, cornstarch, cottonseed, commercial ketchup, margarine and butter replacements, pectin, instant tea, and whey (powder or liquid). Now it’s your turn! 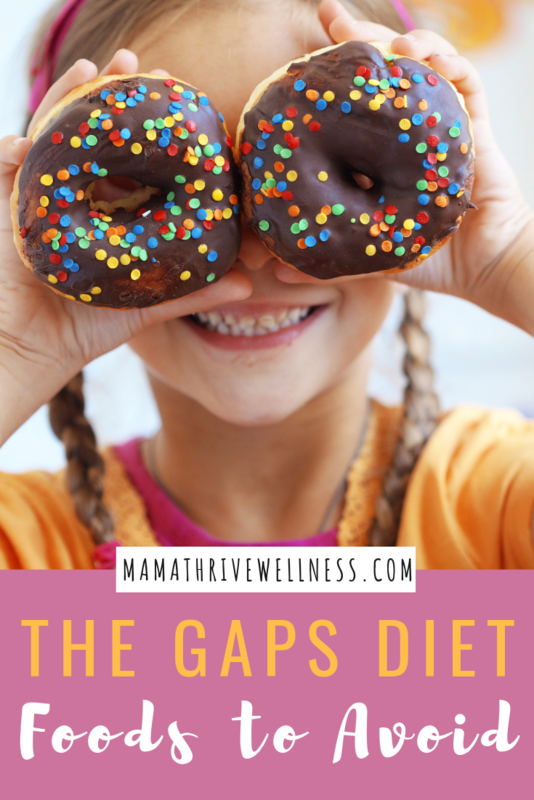 What has been the most challenging part of avoiding certain foods or thinking of avoiding certain foods if you have been on or are considering starting the GAPS Diet? I’d love to hear about your thoughts and experiences in the comments below!